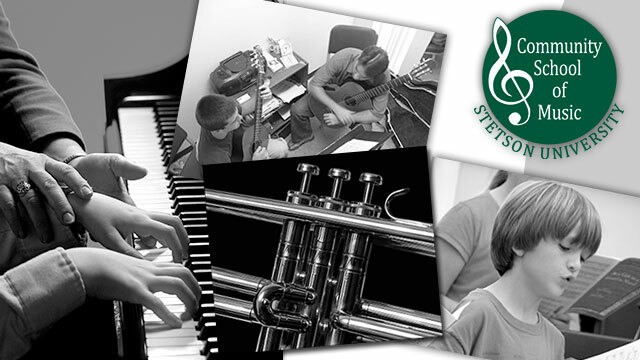 Welcome to the Community School of Music at Stetson University! Register today for Spring 2019! Founded in 1985, Stetson University’s Community School of Music has been providing the highest quality musical education to Central Floridians of all ages for decades! Our association with the Stetson University School of Music continually provides our students with talented and qualified teachers, collegiate-level facilities for lessons and performances, and a gateway to advanced musical study. Many Community School students have gone on to study music at the undergraduate and graduate levels, and have made their careers in music! Whether your aim is to introduce a young child to the wonderful world of music, to pursue advanced musical study, or just to have fun and learn a new skill, the Community School of Music at Stetson University is the ideal place to start and continue making music! Private lessons on all orchestral instruments, including piano, guitar, and voice, are available for children and adults! Children as young as 3 years old can start in our Orff-Schulwerk program - a tried and true method of introducing young children to music through rhythm, dance, singing, and instruments. Youth ages 8-18 who love to sing are encouraged to join our Young Singers choir! Our Youth String Orchestra is open to string players ages 8-18. We offer many Adult Programs as well, including lessons, group classes, and ensembles. We sincerely hope that you choose to pursue your musical study at the Stetson University Community School of Music!